Direct Routing supports configuring one Session Border Controller (SBC) to serve multiple tenants. This scenario is designed for Microsoft partners and/or PSTN carriers, referred to as carriers later in this document. A carrier sells telephony services delivered to Microsoft Teams to their customers. Deploys and manages an SBC in their datacenter (customers do not need to implement an SBC, and they receive telephony services from the carrier in the Teams client). Interconnects the SBC to multiple tenants. Provides PSTN services to customers. Manages call quality end to end. Charges separately for PSTN services. Microsoft does not manage carriers. Microsoft offers a PBX (Microsoft Phone System) and a Teams client, certifies phones, and certifies SBCs that can be used with the Microsoft Phone System. Before choosing a carrier, please ensure that your choice has a certified SBC and can manage voice quality end to end. The following are the technical implementation steps to configure the scenario. Deploy the SBC and configure it for the hosting scenario according to the instructions from the certified SBC vendors. Register a base domain name in the carrier tenant and request a wildcard certificate. Register a subdomain for every customer, which is part of the base domain. Add the subdomain name to the customer tenant. Configure the trunk from the carrier to the customer tenant and provision users. 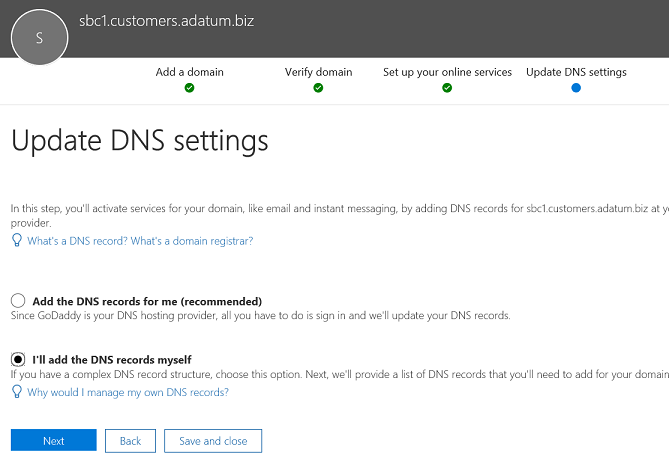 Please make sure you understand DNS basics and how the domain name is managed in Office 365. Review Get help with Office 365 domains before proceeding further. For the detailed steps on how to deploy and configure SBCs for an SBC hosting scenario, please refer to the SBC vendor's documentation. Please pay attention to how to configure the “Contact” header. The Contact header is used to find the customer tenant on the incoming invite message. One base domain name owned by the carrier. A subdomain that is part of the base domain name in every customer tenant. Adatum is a carrier that serves several customers by providing Internet and telephony services. 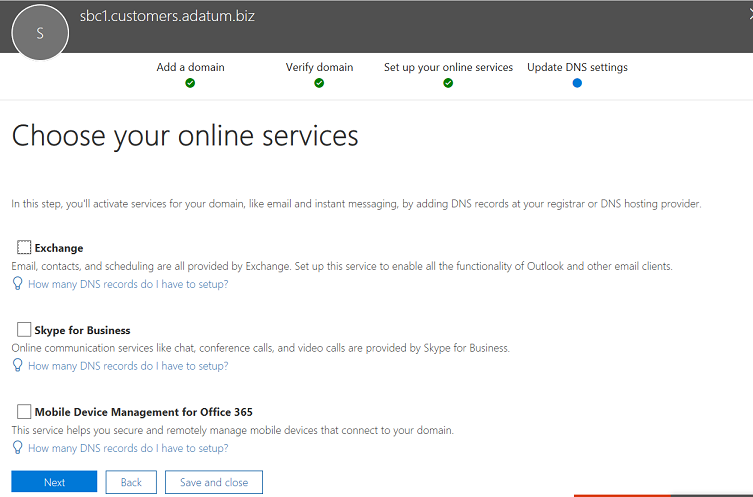 Woodgrove Bank, Contoso, and Adventure Works are three customers that have Office 365 domains but receive the telephony services from Adatum. 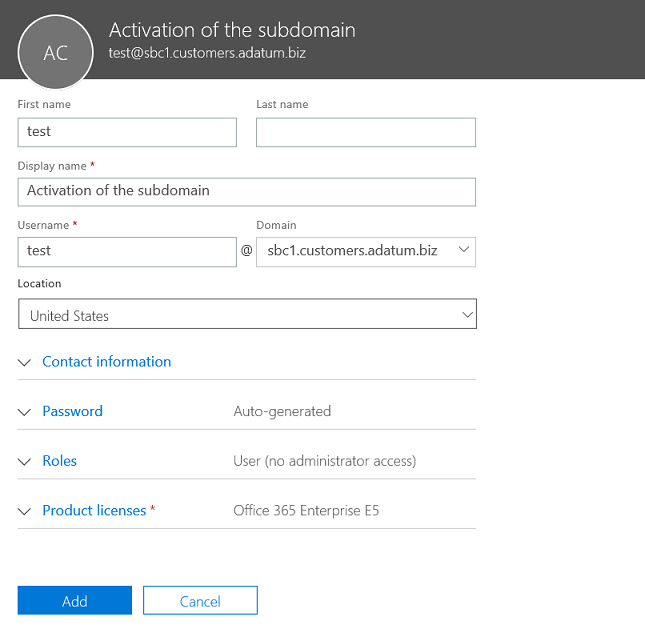 Subdomains MUST match the FQDN name of the trunk that will be configured for the customer and the FQDN in the Contact header when sending the Invite to Office 365. When a call arrives at the Office 365 Direct Routing interface, the interface uses the Contact header to find the tenant where the user should be looked up. Direct Routing does not use phone number lookup on the Invite, as some customers might have non-DID numbers that can overlap in several tenants. Therefore, the FQDN name in the Contact header is required to identify the exact tenant to look up the user by the phone number. Please review Get help with Office 365 domains for more information about creating domain names in Office 365 tenants. 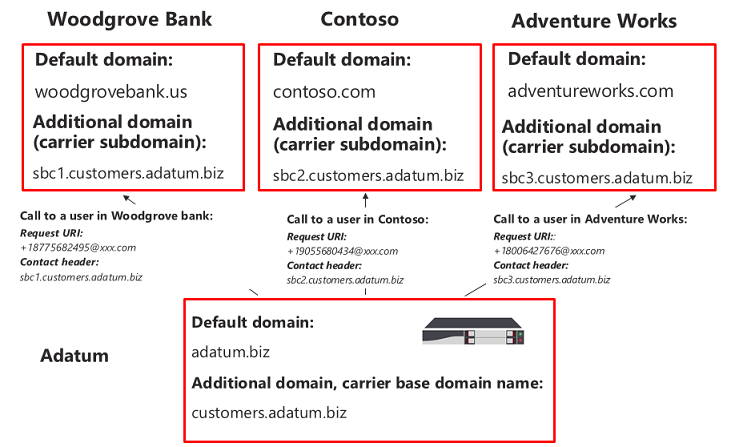 The following diagram summarizes the requirements to base domain, subdomains, and Contact header. The SBC requires a certificate to authenticate the connections. For the SBC hosting scenario, the carrier needs to request a certificate with SAN *.base_domain (for example, *customers.adatum.biz). This certificate can be used to authenticate connections to multiple tenants served from a single SBC. The following table is an example of one configuration. To configure the base and subdomains, please follow the steps described below. In the example, we will configure a base domain name (customers.adatum.biz) and a subdomain for one customer (sbc1.customers.adatum.biz in Woodgrove Bank tenant). These actions are performed in the carrier tenant. You can only add new domains if you signed in to the Office 365 admin center as a Global Administrator. To validate the role you have, please sign in to the Microsoft 365 admin center (https://portal.office.com), go to Users > Active Users, and then verify that you have a Global Administrator role. For more information about admin roles and how to assign a role in Office 365, see About Office 365 admin roles. In the Microsoft 365 admin center, go to Setup > Domains > Add domain. In the Enter a domain you own box, type the FQDN of the base domain. 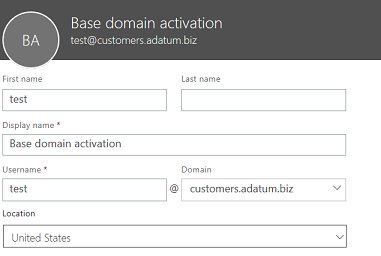 In the following example, the base domain is customers.adatum.biz. 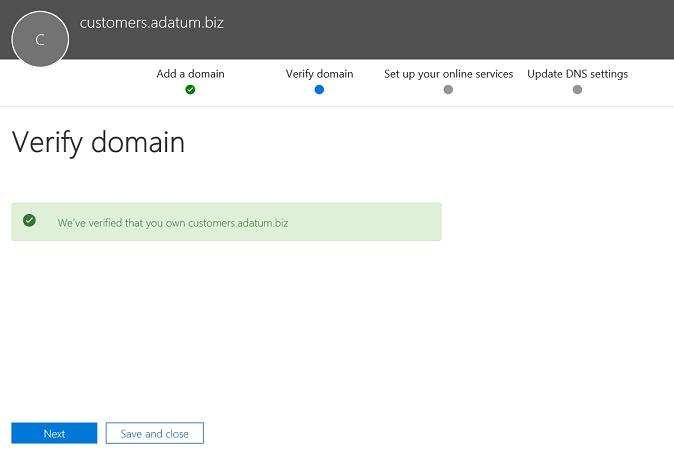 In the example, the tenant already has adatum.biz as a verified domain name. The wizard will not ask for additional verification because customers.adatum.biz is a subdomain for the already registered name. However, if you add an FQDN that has not been verified before, you will need to go through the process of verification. The process of verification is described below. 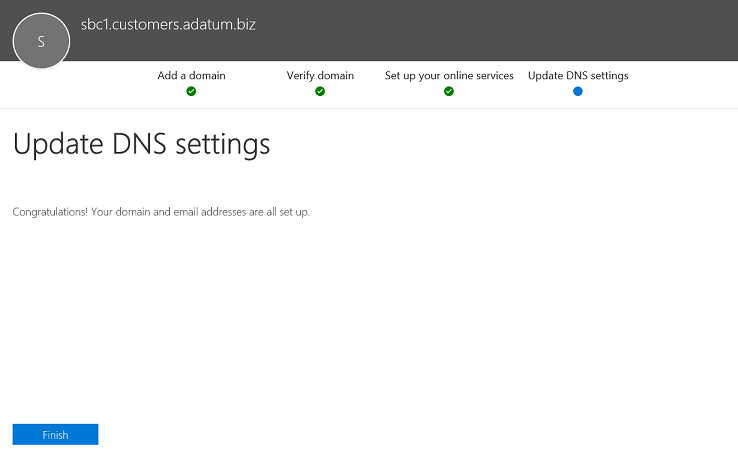 Click Next, and on the Update DNS Settings page, select I’ll add the DNS records myself and click Next. On the next page, clear all values (unless you want to use the domain name for Exchange, SharePoint, or Teams/Skype for Business), click Next, and then click Finish. Make sure your new domain is in the Setup complete status. After you have registered a domain name, you need to activate it by adding at least one E1, E3, or E5 licensed user and assigning a SIP address with the FQDN portion of the SIP address matching the created base domain. Please review Get help with Office 365 domains for more information about adding users in Office 365 tenants. You will need to create a unique subdomain name for every customer. In this example, we will create a subdomain sbc1.customers.adatum.biz in a tenant with the default domain name woodgrovebank.us. All actions below are in the customer tenant. In the Enter a domain you own box, type the FQDN of the subdomain for this tenant. In the example below, the subdomain is sbc1.customers.adatum.biz. The FQDN has never been registered in the tenant. In the next step, you will need to verify the domain. Select Add a TXT record instead. Click Next, and note the TXT value generated to verify the domain name. Create the TXT record with the value from the previous step in carrier’s DNS hosting provider. For more information, refer to Create DNS records at any DNS hosting provider for Office 365. Go back to the customer's Microsoft 365 admin center and click Verify. On the next page, select I’ll add the DNS records myself and click Next. On the Choose your online services page, clear all options and click Next. Click Finish on the Update DNS settings page. Ensure that the status is Setup complete. After you register a domain name, you need to activate it by adding at least one user and assign a SIP address with the FQDN portion of the SIP address matching the created subdomain in the customer tenant. Based on feedback we received in the Technical Adoption Program, Microsoft might change the process of creating trunks in the customer tenants to simplify the process. Please watch the documentation updates on this page and follow the Microsoft Technical Community blogs for further information. 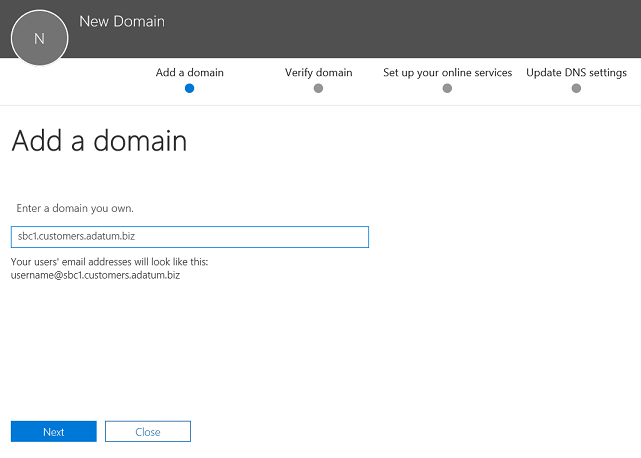 Create a trunk in the customer domain using the New-CSonlinePSTNGateway command. The trunk FQDN MUST match the subdomain created for the customer. 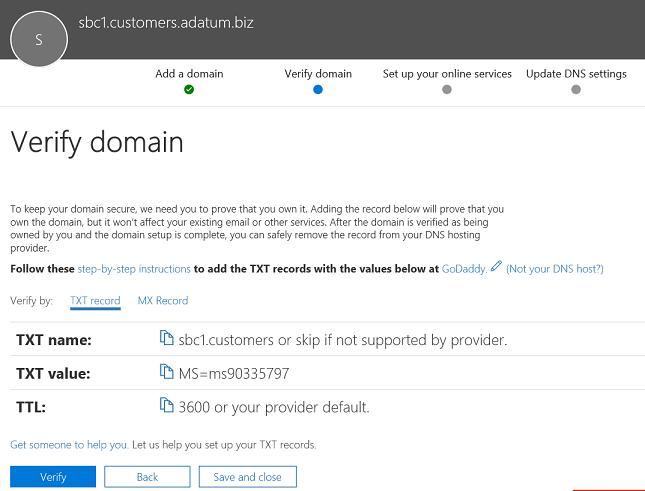 Can not use the "sbc1.customers.adatum.biz" domain as it was not configured for this tenant. Please allow some time for domain registration and activation to replicate and try again. Provision users with the phone numbers and configure voice routing. For more information on the New-CSOnlinePSTNGateway, provisioning users, and configuring voice routing, please refer to Configure Direct Routing. Please refer to the SBC vendor instructions on configuring sending the FQDN name of subdomains in the Contact header.